The "Flaming Chalice" is the symbol of Unitarian-Universalism. Like almost everything else, it means different things to different people. Originally developed by Austrian artist Hans Deutsch, it has evolved many times since then. More about it here. Not being an evangelizing faith, and given the questionable environmental status of holiday lighting, many UU families don't do outdoor lights, period. December also brings tension between those who came to Unitarian-Universalism from Christianity, Judaism and other faiths, given the overwhelming association of outdoor light displays with Christmas. Nevertheless, I've always like holiday lighting, and wanted to do some for our new home in Rogue River, Oregon. 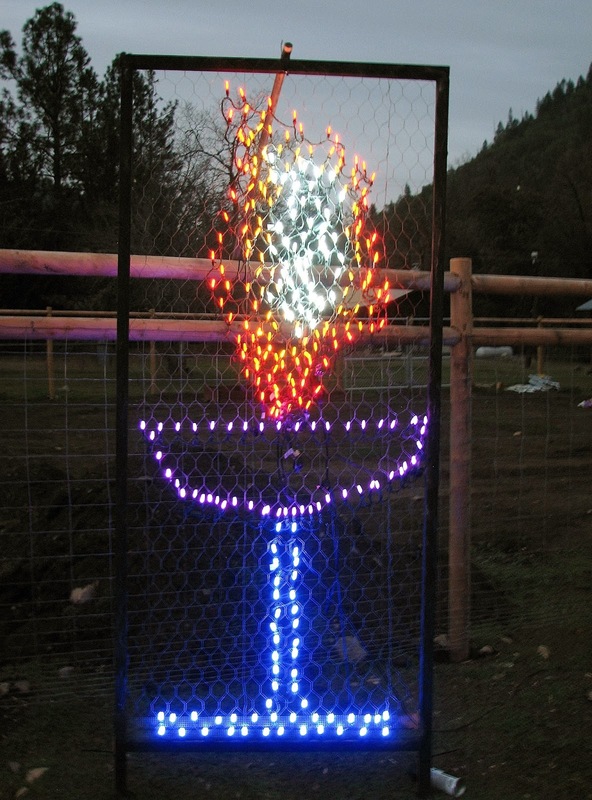 I decided to make a large (about seven feet tall) flaming chalice to display outside our home and to proclaim our UU faith. As an engineer, I quickly realized that the design had elements of regular, linear composition and of the chaotic shape of a flame. I decided to lay out the display using FastCAD, a computer-aided design program I've used for years. The idea would be to design the display on the computer screen, then to scale it up to the full outdoor size. The drawing used a grid of squares (shown here as one foot, but later changed to six inch), so the design could be easily scaled up to full size during construction. I planned to use six 50-light strings of outdoor LED holiday lights. 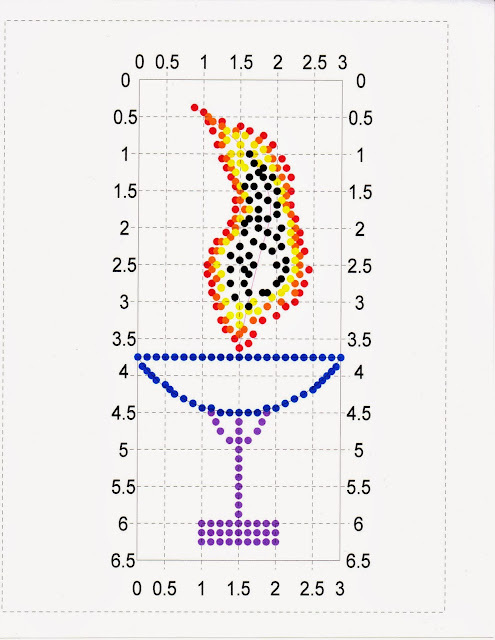 The flame, naturally, would be made from red, orange, yellow and white (shown as black in the drawings) lights, while the chalice would be blue and the base purple. Later, I swapped the base and chalice colors to keep the blue lights away from the slightly-bluish white lights of the flame. The display would be supported by chicken wire, which would support the lights. In turn, the wire would be supported by a wooden frame made of "two-by-two" lumber. A tremendous advantage of CAD software is the ability to "try out" design elements and see how they relate without having to actually build the project. In this display, I decided to center the chalice and base horizontally, and chose to make the top of the chalice the full width of the display (three feet) along a horizontal line 3.75 feet (3 feet, 9 inches) from the top. It took a while to get the arc that forms the bowl of the chalice right. As it is, critics say it's more like a Martini glass than a chalice, and perhaps so. The base was later extensively revised, too, because the version in the CAD drawing seemed too spindly. Wife Deborah pointed out that my original design used a symmetrical flame, and that a windblown, asymmetrical one would be better. It was certainly true, though it made the layout much more complicated. In the original design, I laid out each of the colors of the flame symmetrically around a vertical axis. Now, the layout had to be symmetrical along a constantly-changing axis. 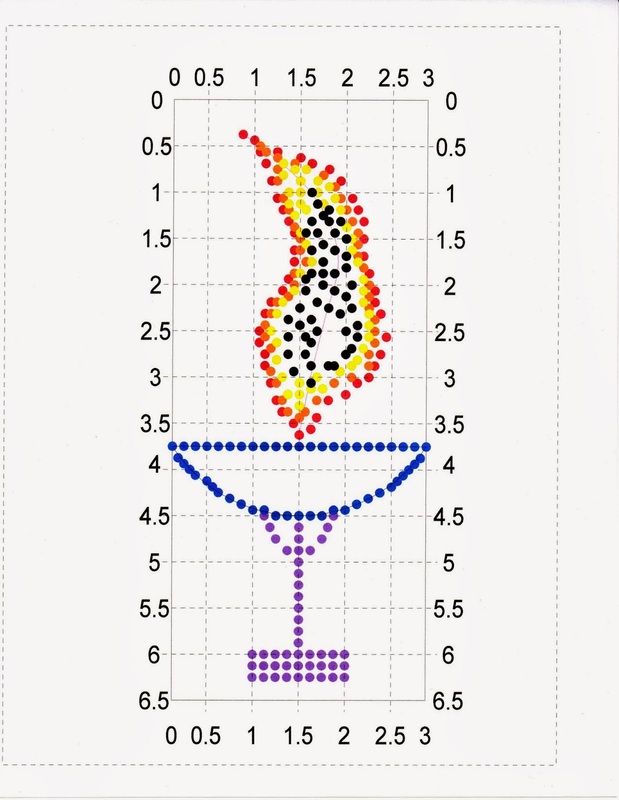 I laid out what I wanted to use for the central axis of the flame on the drawing (shown as purple line running through the center of the flame), then used a built-in CAD function to draw lines perpendicular to the axis over its length. Using single-color strings meant that each light could be no more than four inches from the next in the string. 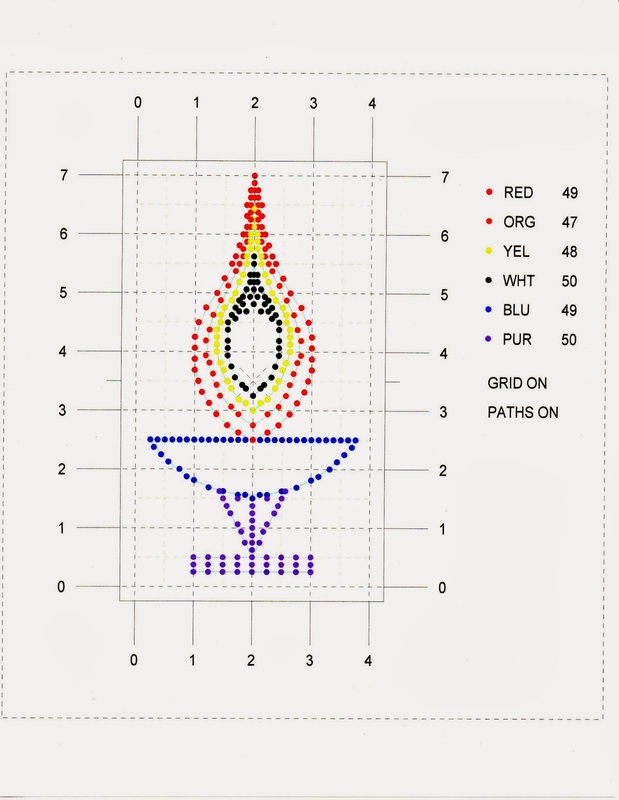 Also, the red outside of the flame is a longer path than, say, the inner yellow one, yet each must use 50 lights. In the design process, I actually created 50 colored dots of each color to be sure things worked out. With the design done and the lights ordered from 1000 Bulbs, I was ready to start building. It didn't really matter if the wood framework was exactly straight and square or not, since the grid from the drawing would govern where bulbs were placed. To make the grid, I laid out colored hemp strings every six inches horizontally and vertically, being careful that they were parallel and perpendicular. Held in with large push pins, I later labeled each grid line with the numbers from the diagram. If I had it to do again, I'd use smaller-mesh chicken wire. The stuff I bought had hexagonal "cells" about 1" by 2". With, say 1" by 1" wire, I could have placed the lights more accurately. The lights were attached using black nylon cable ties (what some people call "Zip Ties") from Mouser Electronics. While you can buy these in local hardware stores, they're fiercely expensive compared to $0.007 price when you buy 1,000 of them. I was fortunate to have a cable tie gun, which tensions and cuts off the tail end of the ties with a pull of the "trigger," though you could certainly do without one. Then, it was just a matter of attaching all 300 lights. After that was done, I removed the grid strings, since they were no longer needed. Finally, I pained the wood frame black so it would not stand out at night. On the first night we lit it up next to the road, Deborah and I wondered if the peasants would attack us with torches and rakes, but nothing happened. "That's because," Deborah said, "People don't know what it is." Perhaps not today. But it's a start. I stumbled upon your page when I did a Google Image search for "flaming chalice." I wanted to tell you absolutely BEAUTIFUL this is. I'm going to try something like it this coming Christmas. I'm not sure it will come out as nice as yours, but I am giving it a try. Thanks for posting this.